An elemental understanding of the responsibility of musical leadership is that a church choir is radically different from a secular or commercial choir not merely in the nature of its repertoire and the intent of its music, but in what the roles of section leader and soloist are. In a secular choir, these roles may, indeed, be somewhat interchangeable. In a church choir, the roles of Section Leader, Soloist, and Cantor are very distinct. They do, however share two things in common: each is a ministry of service to the community, and each ministry exists for the sole purpose of facilitating the prayer of that community. In the same way that there are shortstops who are not gifted as first basemen, or pitchers not skilled as outfielders, so there are soloists who are excellent at interpretive singing and articulate expression, but they are not gifted at leading a section, and there are singers who are great at leading a section, but would not have the gifts to engage the assembly in prayer as cantors. The role here is MUCH more than musical. 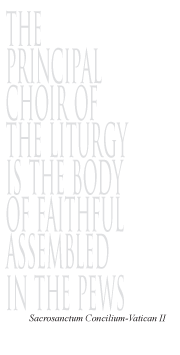 Especially in a volunteer choir, and, all the more so in a church choir, the section leader is not just the musical anchor who holds together the section part. He or she is the shepherd of the section, the team player whose helpfulness and encouragement bring out the best in the volunteer voices. This means, of course, beyond expert sight reading, that the section leader always arrives to rehearsals and liturgies on time, and fully prepared so that the other singers can not only learn from him or her, but can rely on that leader to be fully organized and ready for every cue, every ebb and flow of the liturgical movements. The section leader is the conductor/ director’s ally in the field, in constant eye contact with the director and responsive to his or her direction. At rehearsal and whenever needed, the section leader communicates with the director, voicing the section’s concerns about passages that need more rehearsal, directives that need additional clarification. The section leader is not just a source of notes, but a source of energy for the group, and so they must be fully “charged” and energetic at rehearsals and liturgies. This is a VERY important role in a choir, and a multi-faceted ministry that means so much more than singing the notes on pitch and in time. Soloists, then, have the special ministry of delivering a piece of music, or a section of a piece, in such a way that the assembly is inspired, encouraged, indeed, compelled, to participate in the “prayer” of the solo, and in what follows after the solo. The intention of the solo is to use the inherent artistry of the piece and the prayerful talent of the musician to lift the level of engagement of the listeners from that of passive observation, to active participation. The focus for a moment may be on the soloist who is offering the music, but the clear and authentic intent of the offering is to deftly channel the energy directed momentarily at the performer, to the prayerful content of the music, and then, in turn, to galvanize that prayerful, spiritual energy into a communal experience that transcends the personal performance of the soloist.